Mercy Sister Angela Mary Doyle is a legend in Australian health care and she used International Women’s Day to spread a much-needed message about the stigma attached to perinatal mental health issues. Source: The Catholic Leader. 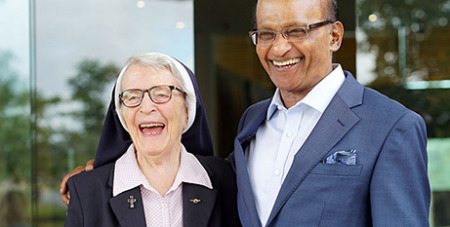 Sr Doyle, an award-winning humanitarian and Member of the Order of Australia, was a guest speaker at the Springfield City Group International Women’s Day event on March 8. She spoke about her work in healthcare, touching on the work she did in the 1980s for AIDS sufferers, a condition with stigma attached to it to this day. But it was another issue with stigma attached that she focused her message on – perinatal mental health issues. “Perinatal” refers to the period of time before and after childbirth. Sr Doyle stressed the importance of spreading awareness about the condition and the need for more services to support women and families suffering in silence. “It’s a disturbing situation, largely hidden and, if not recognised and treated, can have severe and long-lasting consequences,” she said. “Surprisingly this condition affects as many as one in 30 pregnant women and, while it may not be an overtly visible condition, many women will suffer in silence, often not understanding that they have a mental health issue. “The effects can be distressing for the woman and those around her and, if left untreated, can result in adverse effects on the child, relationship breakdown, isolation and even maternal suicide. “If this situation is to be addressed adequately, a range of services is required, including expert psychological and psychiatric support, ensuring the mother is having adequate sleep, taking her food, and that mother and baby are treated together and not separately. “Important too is support for her husband or partner who can often feel lost or bewildered in a situation with which he may not be familiar.